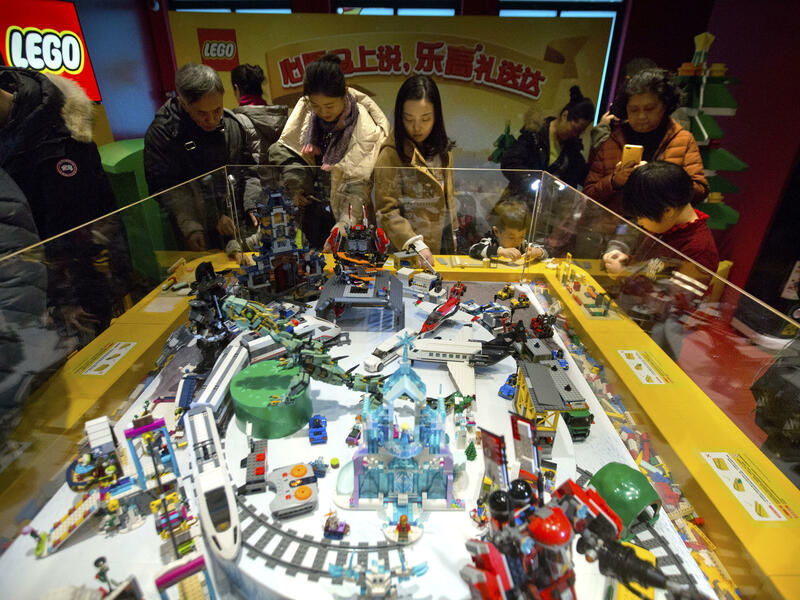 People look at a display of Lego creations at Hamleys toy store during its grand opening in Beijing last year. Exports remain strong for China, but consumption now accounts for 80 percent of the economy's growth. As The New York Times notes, "The country's quarterly growth figure has become so implausibly smooth and predictable in recent years that economists generally look for other ways to gauge China's economic health. One of those is trade, which at one time was a major driver of Chinese growth, though over the last decade it has been far eclipsed in importance by Chinese investment and household spending." China has been trying for years to nudge its economy away from dependence on savings and investment, towards one based more on consumption, which now accounts for roughly 80 percent of economic growth. "The retail sales data tells you a lot about consumption. It is not seasonal - if you look at growth in cosmetics, spending on clothing, spending on automobiles, there has been a persistent trend for a few months," Iris Pang, an economist at ING in Hong Kong tells Reuters. "Consumption is really strong, there is strong wage growth in urban areas. We underestimated the power of consumption in China," she says. Even so, Chinese households have traditionally been unwilling to buy things on credit, preferring instead to sock away most of their earnings out of uncertainty about the future, and the lack of a social safety net. But this has been changing quickly, and now the concern is that household debt has piled up too quickly. While Chinese household debt, at roughly 53 percent of GDP is less than the U.S. at around 80 percent of GDP, it is ballooning at a pace that economists consider unsustainable. Sian Fenner, an economist at Oxford Economics, tells CNBC that Chinese officials will continue "tapping on the brakes" in their goal of a managed slowdown. "They are trying to deleverage the economy, they are also trying to [rein] in some of that credit growth," he says. Some analysts fear headwinds from the heated trade dispute between the U.S. and China. However, those fears may be overwrought. Chinese President Xi Jinping promised to reduce tariffs on imported automobiles last week, prompting a thankful tweet from President Trump. In a phone interview, Dong Yang, the vice-head of the China Association of Automobile Manufacturers, tells NPR that while lower tariffs might eat into Chinese carmakers' profits, they shouldn't be a major worry. "China is already the largest market for cars, it has the largest-scale production, and it has a good deal of R&D, so I think we can hang on," he says.